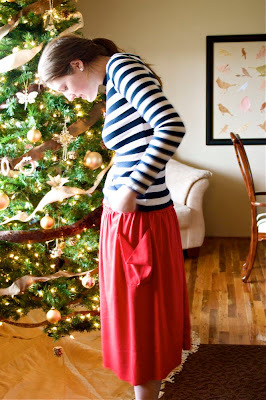 This skirt is so easy! I made these three in less than an hour yesterday. 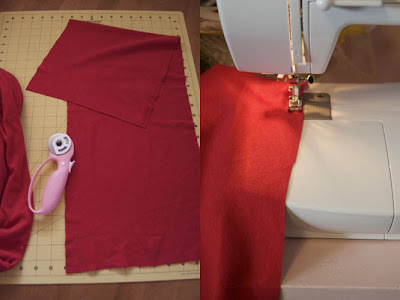 For a child's skirt, you can probably use a t-shirt that you have lying around, but for an adult skirt you'll need to get your hands on some jersey yardage. 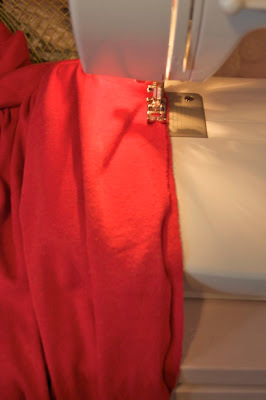 Before you start: Fabrics usually have more stretch on one side than the other, so be sure that you cut your fabric with the stretchy side goes around you! 2) Cut a skirt piece that is about twice the measurement of your waistband, and however long you want it to be. Mine is 25" long. 3) Using your machine's longest strait stitch, sew all the way down the top side of the skirt panel, then pull the top thread to gather, until it's the same length as your waistband. 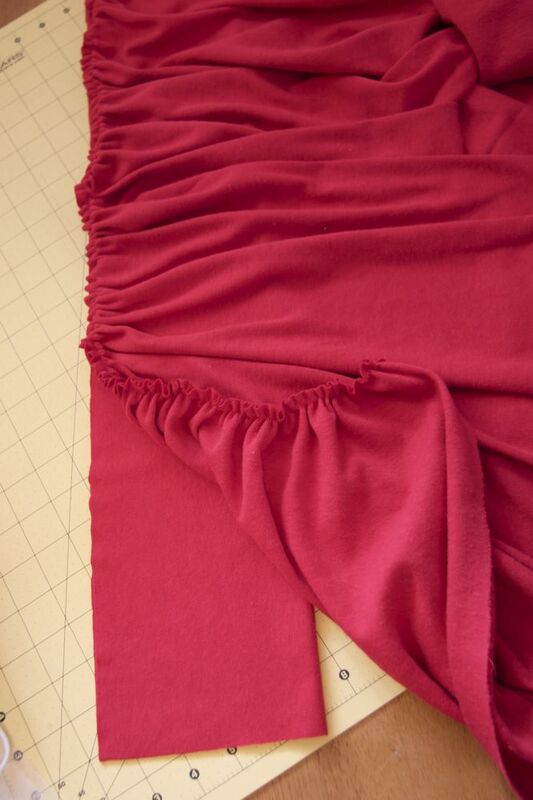 4) Fold the waistband in half width-wise, and lay the skirt panel on top of the open edges. Try to line it up so that the skirt panel hangs over the waistband edges a little bit. 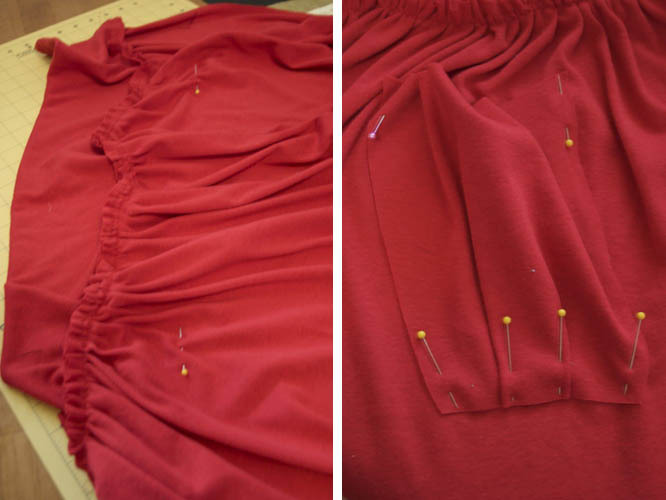 5) Sew the skirt panel onto the waistband, using a zig-zag stitch, then remove the gathering stitches by pulling on the ends of the thread. 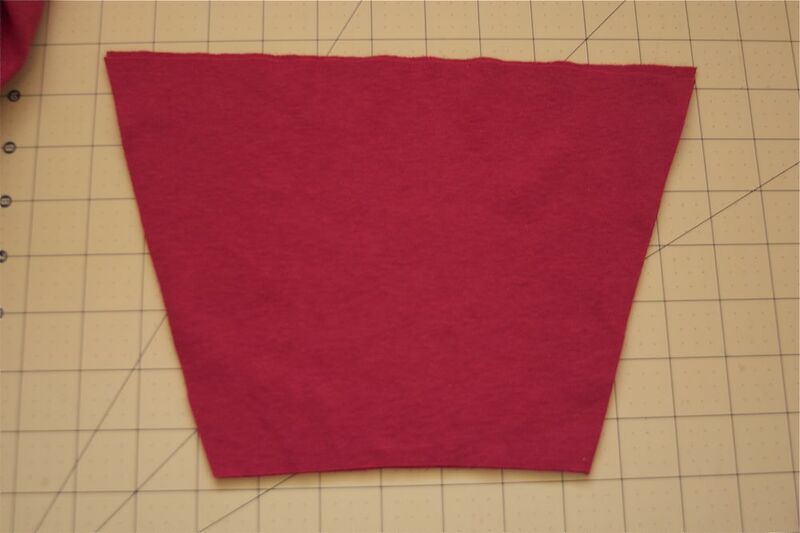 6) Cut out two pocket pieces. Mine were 11" on the top, 6" on the bottom, and 7.5" on the sides. Make sure it's big enough to fit your hands in once sewn! 8) Sew the open ends of your skirt together, with right sides facing each other, and your done! I love it as a high-waisted skirt, with the waistband unfolded! Or if you're not feeling ruffly, just fold the band over them! For the bubble skirt, do the same as the first skirt(skipping the pockets), but double the length of the skirt, fold in half lengthwise, and sew open edges to the band. For the grey skirt at the top, I did the same as the first skirt, but I made the skirt length 3/4 longer than I wanted the finished length to be, folded it almost in the middle (so that the bottom layer hangs down further) and sewed the folded edge to the waistband. Then I sewed a zig-zag around the skirt edges, stretching the fabric as I sewed to make it slightly ruffly. Now that's a fun skirt that looks easy to wear because it's cute and cozy. Love the top you are wearing too. so cute! I love these, they look so comfy and stylish. Thanks for the directions! ok, 1. This post couldn't be more timely. I just bought some jersey to make a skirt but didn't know how I should go about making the fold-over waistband. and 2. You were just over at my blog commenting on my figure, but check you out! You look great! Not that you need it, clearly, but that high-waisted look is super slimming. I'll be giving that a shot for sure! You are my HERO! I am getting married in 39 days and am realizing that I don't have any money for new things. Your tutorials are simply genius and I can't wait to use them to save money in my future and especially once I start having little ones around. I stumbled upon your blog last night and read it for about 3 hours and another hour this morning. 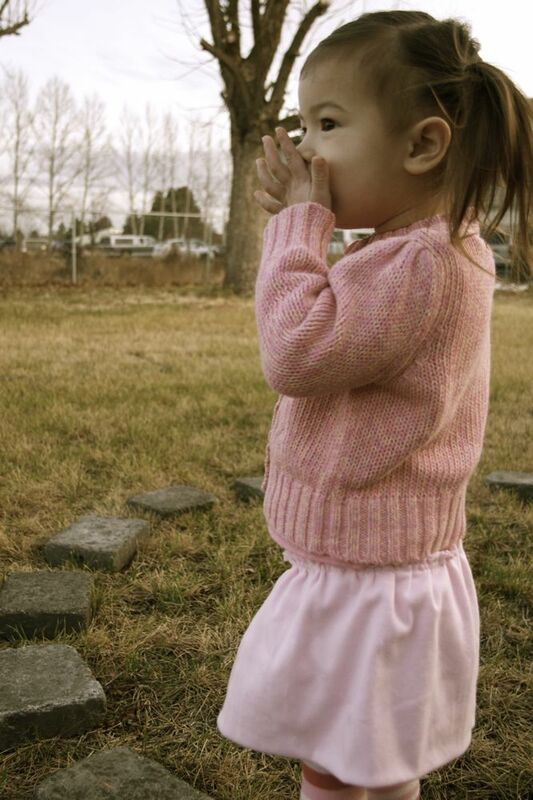 Your little one is precious and so darling in all of those amazing outfits you have made for her! Thank you for also setting an example in being dedicated to the Lord. Like I said before, you are my HERO! So cute! I just love skirts! Fun to make too! oh - and i put a link to your tutorial on my blog - i will be trying this very soon!! This is great. I have a gorgeous jersey sheet that I've been saving for something special. Now I think I know what! i love it! and i have been hoarding some awesome jersey i got at the thrift store. 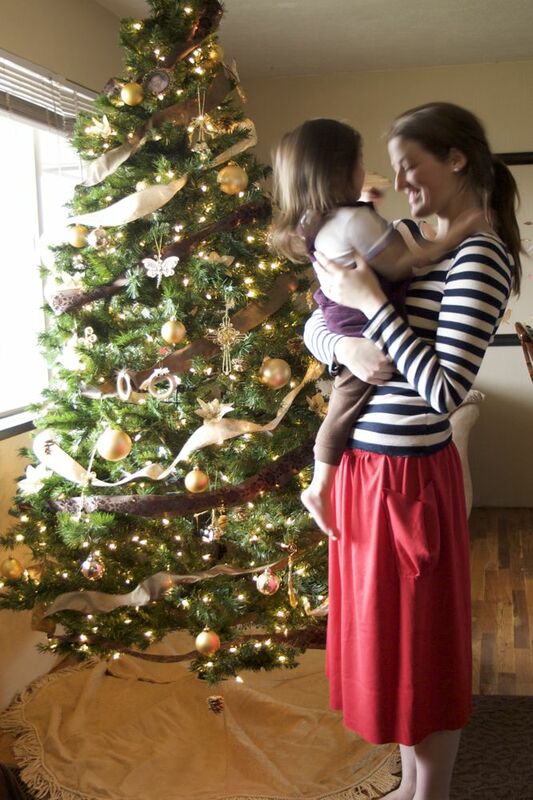 i think a jersey skirt would be fabulous for the post thanksgiving " food baby" belly that i acquire! So cute! I love the color red next to your Christmas tree, picture perfect! Fun fun fun!! 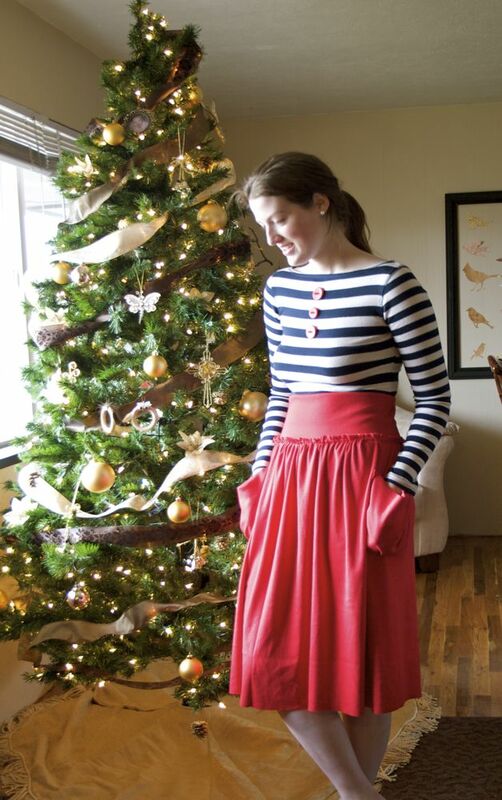 I've been wanting a jersey skirt for a while now and you've just inspired me to make one! Thanks!! I have lots of great ideas to sew about but I'm not good at sewing because everytime I sew it, it ends up to something ugly-ish. Any advice here? Fabulous!! I think I need to make several of these for myself. Disney, thanks for this helpful tutorial! I am a beginner seamstress at best, but I had no trouble hammering one of these beautiful skirts out in under an hour. I can see myself making many more versions of this skirt in the future. I finally got around to making this today, but I am having such a hard time! My thread keeps breaking, and I have so many gaps. I hope it's just my really old machine that's the problem and not me! I was really hoping to wear this to church tomorrow, but I'm not sure what I'm going to do with it now. It is definitely not wearable in it's current state. Great tut! 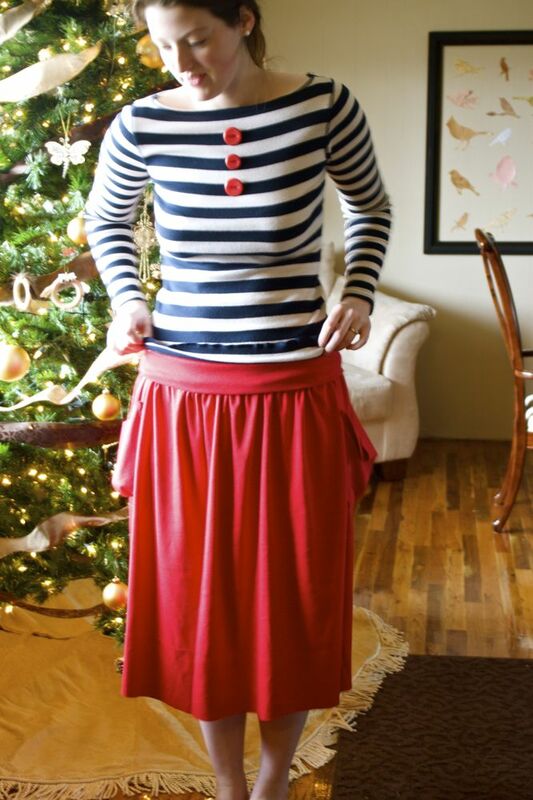 I pinned your skirts to my pinterest page. Thanks! This may be a silly question but how do you get the skirt on? Is there a zipper or closure that I missed or does it just slide on? Love this skirt!!!!! 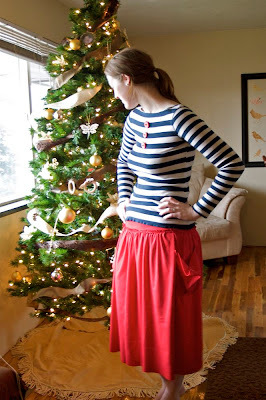 This may be a silly question but how do you put this skirt on? Does it just slide on or is there a closure I am missing? 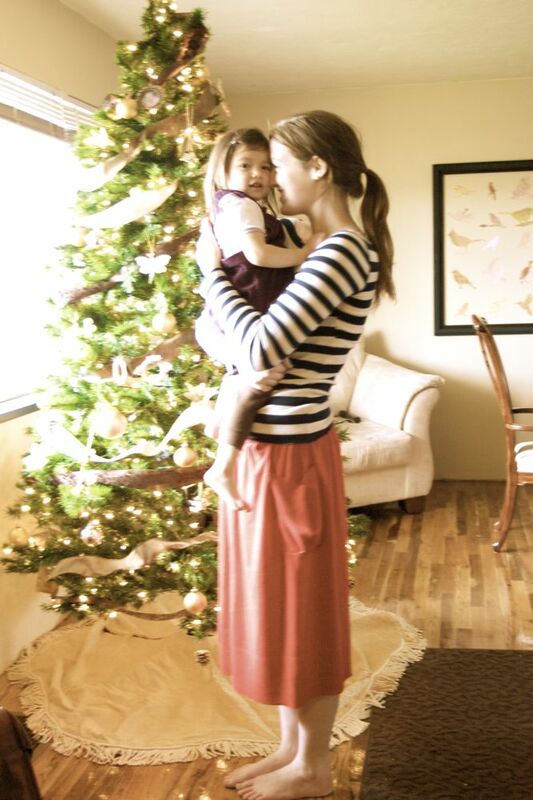 Love this skirt!!!! I just finished making this and it was so easy! I am in love with the finished product, thank you so much for posting this tutorial! Hey there! So I'm loving this skirt and tried to make one for myself, but must be doing something wrong with the wasitband because it has no give and I can't get it over my hips. Can someone please tell me what I'm doing wrong please? I'm a beginner sewer... I'm trying to sew the panel onto the waist band front he right side but since I'm not that great at sewing a straight line, in curves and then I have parts of the skirt where the waist band is not attached to the skirt. should I be sewing the two together from the wrong side or the right side or does it even matter? Thank you so much for sharing! I hope I can make mine as cute as yours!